Champions Manchester City are seven points off the pace set by Liverpool, something that has come as a surprise to Jurgen Klopp. Liverpool manager Jurgen Klopp accepts it is a surprise to see his side so far clear of champions Manchester City in the Premier League title race. Leaders Liverpool head to City on Thursday with a six-point lead over Tottenham, while successive defeats to Crystal Palace and Leicester City over the festive period have left Pep Guardiola's side a further point back in third. Nine consecutive victories in the top flight means momentum is with the Reds, but the meeting at the Etihad Stadium offers City a chance to start chasing Liverpool down and end their 20-game unbeaten run. And despite his defence being boosted by big-money signings Alisson and Virgil van Dijk, Klopp did not expect Liverpool to establish such a dominant position atop the Premier League. "That we are in this situation is a surprise," he said to Sky Sports. "Everyone said, 'yes, they are good', but nobody thought we would be seven points ahead before the game. "It wasn't possible at the beginning of December when we were one point behind and because of the games we played and they played, it happened. It doesn't make them worse or us better, it is just the situation and now we have to play the game. "Now, we are in a really good moment, that's true, but we have to go to Manchester City and play all the other big ones apart from Arsenal. "It's football. I don't need to know now what will be in May. Who can't really live with the time between now and May? Go on holiday and switch everything off then come back in May and see what happened. I cannot change that. I don't want to. I want to enjoy the ride until May! "For us, the target was to qualify for the Champions League and even that is not sure because the others can win 17 games in a row. We have to only be focused on us and that's what we do and so far, the mood in the club and around has got better and better. We will see where that leads us to." 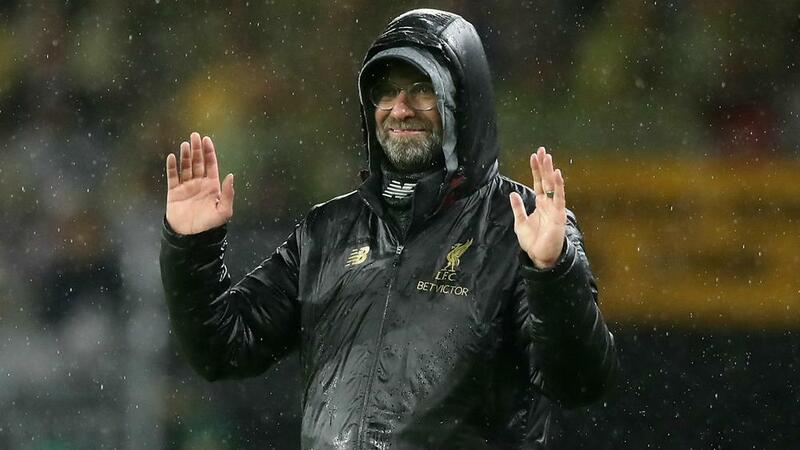 Liverpool's last title came in 1989-90 and Klopp is yet to win silverware since joining the club in 2015, losing in three finals, but he is not troubled by the weight of expectation on his shoulders. "I'm here for three and a half years, I don't know, and I don't think we have to think about the size of it," Klopp added. "At one point or another, some team will change the fortune. If that's going to be us, I don't know. All the other people say, 'it slipped through their fingers, they were close there', and it's a funny thing for all the other supporters of other clubs. "The supporters listen to that, but I don't, so for me, it isn't important what happened four, five or 10 years ago because it's not my story. You need someone who was not involved in that. I am not nervous about it. If I fail, I fail but I don't fail because someone failed 20 years ago. "So, if we succeed, we succeed, because we did it right and not because someone did it 20 years ago. We will try everything we can, but we cannot try more."